Shark finning is threatening the existence of sharks! Hundred of millions of sharks are killed annually for their fins alone. STOP eating shark's fin if you want the killing to stop. Shark Fins - This expensive delicacy has been revered in China for centuries. Mainly used in such exquisite dishes as shark's fin soup, shark's fin is prized for its slippery and glutinous texture that results in a thickened soup without the use of cornstarch, similarly to bird's nest, another Chinese top delicacies. Regarded as a tonic food and an aphrodisiac, the Chinese believe shark's fin strengthens the internal organs and retard aging. Strictly speaking, shark's fin is actually the cartilage, the flexible soft tissue of the fin. The top or dorsal fin has the highest quality and costliest, followed by the tail fin and lastly the side or pectoral fins. Basically, shark's fin is graded by its length - the longer the cartilage, the better the quality and can range from an inch to more than a foot long. 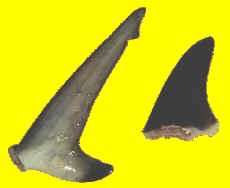 Shark's fins are sold in frozen or dried form. The frozen one comes in strands are ready to use after an hour soaking. As for the dried form, they are two versions available - skinned (shredded) or un-skinned (whole) and they require more preparation. 1. Soak them in warm water for about an hour then rinse under running cold water for 10 minutes. Drain. 2. Place the shark's fin in a pot and cover with water or clear chicken stock with scallions and ginger. Bring to the boil, cover and simmer for 6 to 8 hours. Drain and discard the water/stock. 3. Wash under cold water when tender to remove the odor. 1. Drop into boiling water, turn the heat to low and simmer for 3 to 4 hours. Drain and let cool overnight in fresh water. 2. Clean the surface, remove soft bones, peel the skin and wash under cold water. 3. Repeat step 1 and 2 until all the rough skin are removed. 4. Proceed to soften it using the method above for skinned fin. Note : Over-boiling may 'dissolve' the fins, especially younger or shorter ones. Shark's fin is tasteless but has an amazing ability to bring out and enhance the flavor of other foods cooked with it. It is usually simmered in rich flavorful broth.